Apricot kernel oil is a light, fine textured carrier oil that is high in polyunsaturated fatty acids and particularly useful for dehydrated, mature, delicate and sensitive skin. It is a perfect oil for facial massage, especially when combined with the appropriate essential oils, as it spreads evenly and gently over the skin. Due to it’s oleic acid content, it is well absorbed and doesn’t leave an oily residue on the skin. Use either instead of, or in combination with other carrier oils. It is a lovely alternative to sweet almond oil for facial massage. It can also be used to make body oils and scrubs. Apricot kernel oil is extracted from the soft centre of the apricot stone. 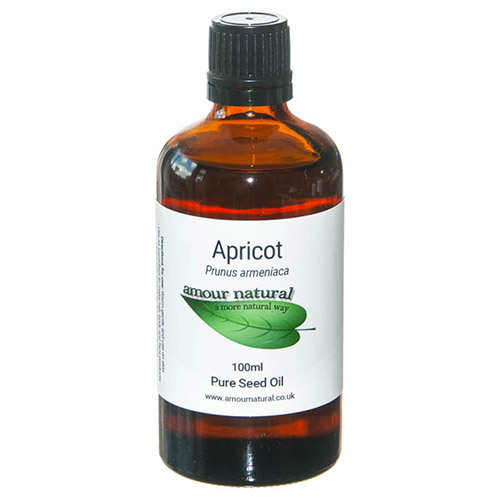 Amour Natural’s apricot kernel oil is lightly refined to remove it’s distinctive smell, making it perfect for incorporation into skin care products. 100% pure apricot Kernel Pure oil, naturally lightened and steam deodorised. Warm gently and use on skin. Especially beneficial for facial massage. Mix with carrier oils and essential oils. Can be used as an ingredient to make hair, body and face products. Below are reviews of Amour Natural Apricot Kernel Pure Seed Oil - 100ml by bodykind customers. If you have tried this product we'd love to hear what you think so please leave a review. I'm happy with my purchase and it feels very nourishing to my skin.